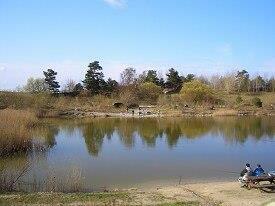 Myrup Fiskepark is working to become best and most scenic Put & Take for everyone in Sydsjælland . Myrup Fiskepark has 2 lakes. One is a large lake of 20,000 squaremeters. It is suitable for jigging, spinning and fly fishing. The second lake is 10.000 souaremeters. Everybody can fish in this lake, but the children have priority. Angling license: Self service by the shed, MobilePay 33835.